Everybody who was there at the time, from he sixties through the seventies, knew Iron Mike, and it seemed like you couldn’t walk past the boardwalk shop without stopping in to see him. He was the star attraction in a shop full of sea shells, antiques, historic replicas, whaler’s harpoons, a giant whale bones, and nautical gifts. Iron Mike was an early metal deep sea diving suit that seemed to have found its niche in the back of Sam McDowell’s shop. The shop’s motif was a good reflection of its owner, who was born in Somers Point, was an Ocean City lifeguard, taught art at Princeton in the winters, and ran his boardwalk shop in the summer. Vacationing on the West Indians island of Becquia in the winters, McDowell filled some of his shop with exotic art, crafts he brought back from the islands, including scrimshaw, which McDowell, the artist, started carving himself. At a private part in Princeton, he met then Senator John F. Kennedy, an avid scrimshaw collector who admired McDowell’s work, and advised him to develop that talent more fully. So under the advisement of a future president, McDowell left Princeton and Ocean City, moved fulltime to Bequia and spent most of his time carving scrimshaw, which he found even more lucrative and enjoyable than teaching or hawking his Smuggler’s wares on the boardwalk. He also bought a summer home in Carmel, California, where he often took his Ocean City lifeboat-like rowboat into the waves. But what became of Iron Mike? Since I didn’t know I told Steve that Sam was in Carmel, California and he might be able to answer his question, which sent him on his quest to find Iron Mike, and send back the following report. Many of us who visited Ocean City from the 50s through the 70s remember the Smuggler’s Shop – that fascinating combination of store and nautical museum at 13ths Street on the Boardwalk. 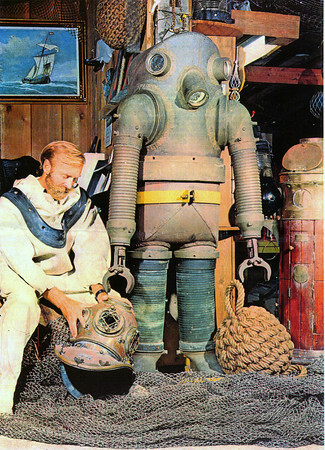 Although I was very young when I visited the Smuggler’s Shop, I have vivid memories of the place and its two shopkeepers, Sam McDowell, the shop’s owner, and Iron Mike, the imposing armored diving suit that greeted visitors. During a recent visit to Ocean City I felt inspired to find out what became of both. Now in his 80s, Sam wrote that he now lives between his home in Carmel, California and his long time second home in Bequia, an island in the West Indies, though he seldom gets down there anymore. Bequia is where he acquired some of the memorable items for his shop, such as the giant whale skull and native arts and crafts. Sam said he is enjoying life with is wife, kids and grand kids, though he seems far from retired and makes a living as a full time artist, doing both painting and scrimshaw. He is recognized as one of the best scrimshaw artists working today, and also collects historic scrimshaw pieces. Sam focuses much of his time making fine art, hand-crafted scrimshaw pocket knives, which are sold by fine art galleries across the country. 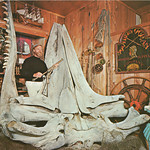 Sam was also kind enough to include scans of two postcards he formerly sold at the shop, one of Iron Mike and one of the huge whale skull. On the topic of Iron Mike, Sam said that he had sold the iron diving suit to a nautical museum in City Island, in the Bronx, New York, but later heard that it ended up in Florida, but he did not know where. Those who remember Sam and the fascinating items in his shop may want to check out some of the galleries that sell his scrimshaw pocket knives. They’re collectible works of art that could also hold some personal meaning to those of us who remember the Smuggler’s Shop days. It took a lot of internet searching to find any current information on Iron Mike. 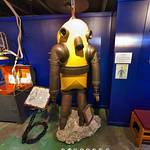 Finally I found some pictures on Flickr tagged as Iron Mike that were taken by some tourist of a large yellow painted diving suit in a museum in Islamorada, Florida. When I looked closely at the pictures, there was no doubt it was Iron Mike, who had received a yellow paint job on his upper body at some point in his travels. While it appears that Iron Mike is a popular tourist attraction, the museum doesn’t mention him on their web site. I called the museum to see if they had any more information about Iron Mike and his history and virtually met Amber Weller, of the Florida Keys History of Diving Museum, the present home of Iron Mike, and she filled me in with many of the following details. Iron Mike was built in the early 1930s by the Empire Marine Salvage and Engineering Corporation of New York City, which was headed by Thomas P. Connelly. A patent filed in 1934 lists Mr. Connelly as the inventor. The company had an address at 17 Battery Place in New York, a few blocks south of the present day World Trade Center site. But the salvage operations appear to have been based across the Hudson River in Jersey City, New Jersey. 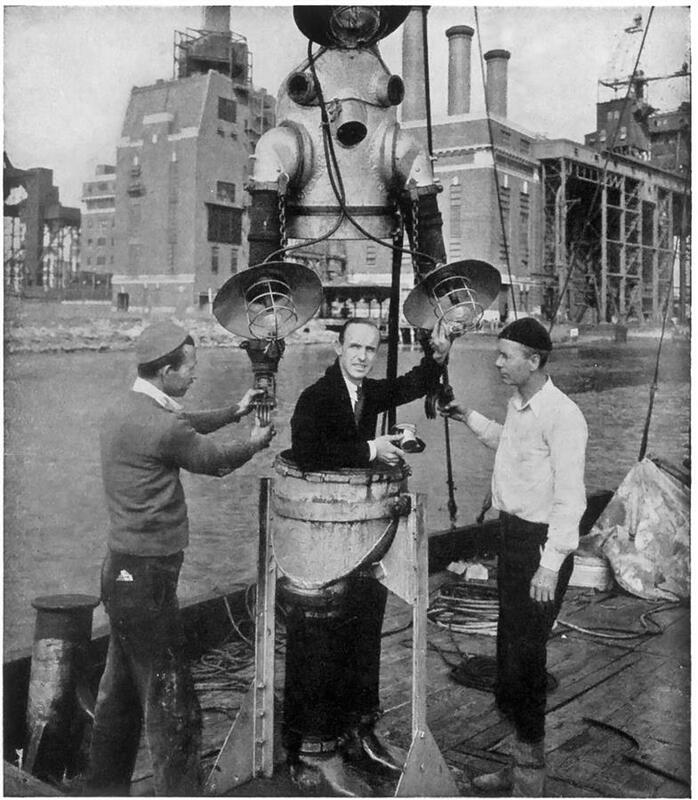 Iron Mike’s primary ‘occupant’ was a well known commercial diver, Roy R. Hansen, of Perth Amboy, NJ. Iron Mike was fully pressurized and self-contained, with an oxygen tank that provided approximately four hours of air time, which was included within the suit, so no air hoses were necessary, and a bottle of caustic soda would absorb the CO2 emitted by the diver. A telephone line was attached so the diver could keep in contact with the boat on the surface, and the mechanical “hands” of a grappling jaw permitted him to grasp objects. The suit consists of a top and bottom pieces, secured together with a threaded ring, which could easily be opened. The buoyancy of the suit made it naturally return to an upright position, a feature the diver could take advantage of to lean over to closely inspect an object, as the suit would upright itself. Iron Mike undertook three dives that received notable press coverage, and made him something of a celebrity. There were likely other dives, but without the company’s records, they can’t be documented. If Iron Mike could speak, he probably would have many fascinating stories to tell. HMS Hussar, October, 1934. The Hussar was a British ship carrying pay for their soldiers during the American Revolution. In 1780 the Hussar hit a rock and sank in the Hells Gate, a treacherous waterway off New York City. Mr. Connelly’s company was one of at least three parties that attempted to locate the ship in the mid-1930s. For this mission, Iron Mike was outfitted with a huge light above his head and one on each arm, and dragged through the water behind a tugboat called the Terminal. Despite the relatively shallow depth of about 120 feet, Hansen called the job one of the nastiest of his career due to the strength of the currents. The search continued along the shores of the Bronx for about a month during which Hansen identified six shipwrecks, none of which was the Hussar. The search was then called off because Simon Lake, the inventor of the modern submarine, and Pleasantville, NJ native, claimed to have exclusive rights, granted by the Treasury Department, to recover the Hussar. Lake was ultimately unsuccessful in this effort. It is now believed that the amount of blasting, dredging and filling in the Hells Gate, beginning in 1876, probably buried the remains of the Hussar under landfill in the Port Morris section of the Bronx. A humorous side note – a Time Magazine article about the dive said the crew had nicknamed the suit “Eleanor.” Thankfully, someone later reconsidered this decision and Iron Mike took hold. Merida, August 1936. The Merida was a passenger steamer carrying gold and silver bullion from Mexico in 1911 that collided with another ship and sank off the Virginia coast in about 270 feet of water. The cargo had an estimated value of $26 million in 1936 dollars, or about $425 million today. Mr. Connelly and company dove the wreck with Iron Mike in August 1936, and according to some reports, they did salvage some of the cargo, but no details were provided. However, the book Treasure Legends of Virginia states that the company’s expedition failed, after having spent $250,000 (about $4 million today). A New York Times article about the expedition reveals some interesting insights about the mission and Iron Mike. Roy Hansen, by this point very experienced using Iron Mike, was supremely confident in the suit and the changes of success on this mission. He even claimed he could stay down for 16 hours at a time. Hansen also said he believed the suit could dive to 2,000 feet. The article named his two assistants – James Cullom and William Hogarty, both from Jersey City. 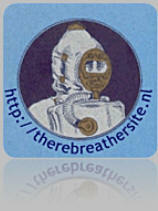 Most interestingly, the article refers to the presences of two diving suits matching Iron Mike’s description. Amber discovered in her research that there was an earlier suit, very similar to Iron Mike, believed to have been designed by Benjamin Leavitt of Camden, New Jersey, and this suit may have also been used for the Merida mission. Nevertheless, most documentation indicates that Thomas Connelly only built one Iron Mike suit. Quarry Dive in Pen Argyl, Pa. September 1936. Shortly after the Merida dive, Iron Mike was used to recover the body of a 13 year old boy who drowned in a flooded quarry in Pennsylvania. In completing this somber task, Roy Hansen claimed he dove to 510 feet, a record at the time, but this could not be officially confirmed for the record books. It is not clear what became of Thomas Connelly and his company, or when Iron Mike was retired from commercial diving. Iron Mike was reportedly stored at the Philadelphia Naval Ship Yard at some point in the 1940s, and after that was part of a live diving demonstration in Atlantic City, probably at Steel Pier. From there he was acquired by Sam McDowell and spent his years in Ocean City. Around the time Sam closed the Smuggler’s Shop, around 1980, he sold Iron Mike to the Northwind Undersea Institute in City Island, Bronx, NY, a museum co-founded by folk singer Ritchie Havens. From there Iron Mike was acquired by Drs. Joe and Sally Bauer, the founders of the Florida Keys History of Diving Museum in Islamorada, Florida, and the museum has been his home ever since. Sometime before he got to the museum, his upper body was painted yellow for an unknown reason. The museum is interested in restoring him to his original finish, but does not have the resources to do so at this time. Today, Iron Mike is one of the most popular attractions at the Islamorada museum. Special thanks to Sam McDowell, for sharing his recollections, and Amber Weller of the Florida Keys History of Diving Museum for sharing her research and patiently answering my questions. Amber’s research skills and attention to detail have uncovered a lot of fascinating information about Iron Mike.